If you haven’t guessed by now, you’re probably new to this site, and if so, welcome! If not, you’ll undoubtedly know that I am an iOS text editor enthusiast to the umpteenth degree! I really love what developers out there have done to create such robust and fun ways to create words and text on such tiny screens and devices! One that I’ve been playing around with for a good amount of time is Drafts. Drafts, on it’s own, is a very elegant and clean text editor that’s UI is completely spartan by design. It main function is for you to launch it, jot a note or idea down and close it. 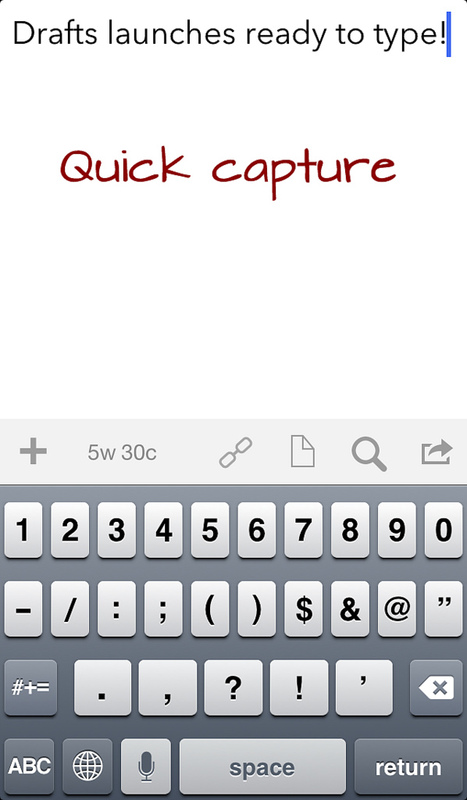 The app saves your work in a plain text format and the next time you open the app? It starts a new note. This wash, rinse, repeat philosophy is what got me to first buy and try the app. But, it’s only when you open up Drafts and use it for a bit, that you realize that this text editor quite unique and powerful. Aside from the impressive collection of fonts that the kind folks at Agile Tortoisebaked in, you also get the requisite font size selector and two other themes to mix things up a bit (white text on black and a “Sepia” toned dark brown text on tan based theme). There is also a new view in the latest version of the app that is quite handy called “Link” mode which makes all the links that you type in to a note, tap-able! URLs would be easy but this view also includes phone numbers and even addresses! Think about it, you get a phone number from someone, put it in Drafts, and instead of holding down on the text, making sure it’s selected, opening the phone app, copying it into the dial field and tapping dial, now all you have to do is tap the “Link” mode in the note, tap the number, then dial. It’s that easy! It also has sync but the folks at Agile Tortoise didn’t want to jump through the myriad of hoops that Apple makes you go through to hook your app up to iCloud so they went with the well-thought-of sync project “Symperium”. In my using of both Drafts apps for iPhone and iPad, I’ve found the sync to be almost instantaneous and, most importantly, reliable. 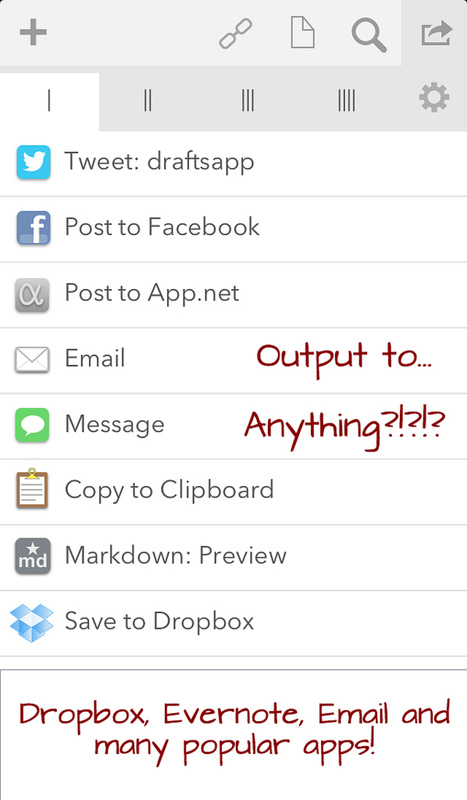 Which has been a little bit of a sticking point for me with the somewhat recent implementation of iCloud sync in apps. The only catch though with going with Symperium is that it doesn’t allow you to sync with your Mac (or PC, yet…). Presumably, going with the more “open” Symperium service, would afford the opportunity sync cross platform/device, but that hasn’t happened yet, so the only way you’d be able to get your notes out of your respective iOS device is through the sharing options provided to you. The good news? This is definitely where Drafts shines! When you use Drafts you could almost overlook the sharing button in the toolbar of your notes, but after you tap it… man… there are a ton of options! And last but not least you can choose “Open in…” which allows you to open the note in any other text editor that you have on your device. That’s quite a list! And they keep adding more with each version that drops! With these sharing options, Drafts has become a my springboard for whenever I even have a whimsy about sharing a piece of text in more than one place. They’ve made it too damn easy to not see it as your default app for that. If I wasn’t such an iOS text editor junky, I’d probably have this as my sole go-to editor. Add in it’s full support of Markdown and it’s really a no brainer. To date I’ve used it for quick notes (movie names, phone numbers, etc…), calendar events, to do lists, entire chapters of the novel I am writing, Tweets, Facebook posts (when I actually am on FB), blog posts (though not this one), and the list could go on and on but you get the point, this app is a tiny juggernaut. So go get it! Highly recommended! What about the guys that made it? 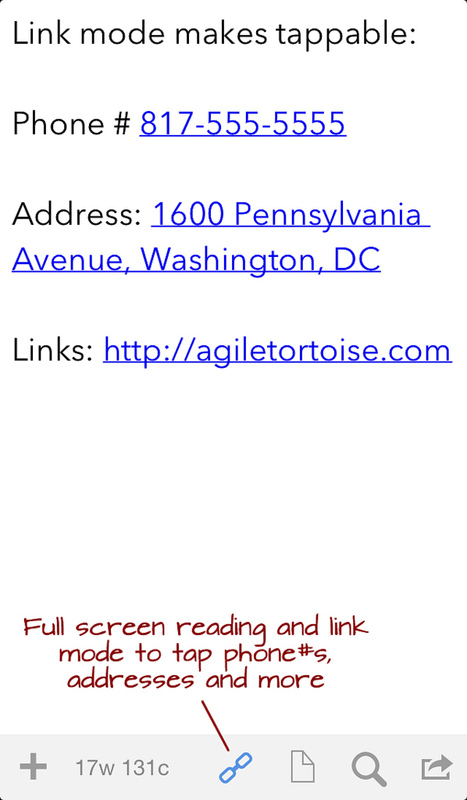 All images in this post were linked from Agile Tortoise’s own website.